Day Thirty – Challenge Complete! Frankly, I’m amazed that I was able to post something every day for thirty days in a row! I’ll admit to cutting corners, taking advantage of each “Wordless Wednesday”, “Throwback Thursday”, and “Flashback Friday” whenever possible to avoid time consuming creativity. The majority of my writing was consisted of little more than glorified Facebook posts. But in light of all that was happening this month, and reviewing the daily blog posts provides a reminder of the craziness, I’m OK with my inconsistent output. My excuses include the pressures and time constraints of harvest, a family medical emergency, the destructive storms, calving, holidays, etc. Having said that, I’d like to thank Holly Spangler for providing the challenge of daily blogging. This month, I tried to read as many posts as possible from the other bloggers taking part, and discovered some great new blogs to enjoy. I still have a list of potential blog topics, I just need to find time to get them written. Taking part in the challenge was an interesting experience and I feel relieved and happy to be at the finish line. Interested in learning who else participated in the 30 days blog challenge this month? Head over to Prairie Farmer to find out! Here’s a cute one for Flashback Friday…going all the way back to the fall of 1965. 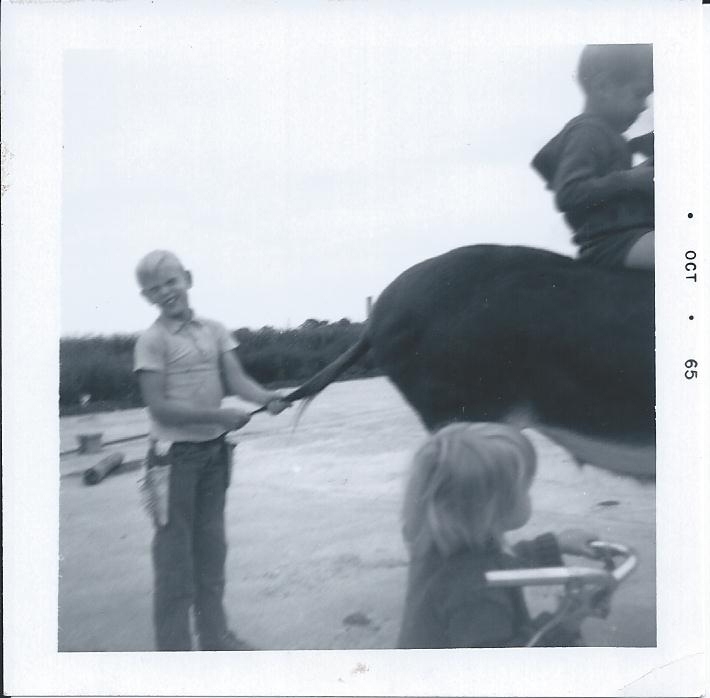 Yes, my husband’s family had a donkey on the farm at that time, a gift from the children’s grandparents. The donkey was not stupid, apparently it would frequently take the rider to an area with trees with particularly low branches, just low enough to knock off whomever was atop! As is the case with so many of these old photos, one has to wonder what’s the “rest of the story”. Why is my husband at the “wrong” end of the donkey, and why is Cousin Andrew riding high in style? Will JoAnn be able to pedal away in time? Are those guns loaded, Gary? I also get the feeling that something unpleasant was about to happen, something that might quickly wipe that squinty smile from my future husband’s face (and possible dirty those clean clothes)! The possible captions to this one are endless! Interested in learning who else is participating in the 30 days blog challenge or the five things Holly Spangler will be talking about this month? Head over to Prairie Farmer to find out! Once all of the chores are completed this morning, we’ll be traveling about a mile to my in-laws for the annual get-together at their farm. There will be a houseful of extended relations and friends, and an incredible home-cooked feast. I’ll get to spend time with some of my favorite people. It will be a very pleasant, fun, and relaxing day. Tomorrow we’ll be venturing a little farther away to a gathering of my dad’s family. It will be wonderful to see everyone, some are travelling here from South Dakota and Kansas. I’m looking forward to catching up with those we don’t see often enough and a chance to marvel at how much the kids have grown. There are no “drunk uncles” or drama at either place; we manage to keep it light and avoid any controversial conversations. Yes, it’s somewhat predictable. And I like it that way. My family and friends are right at the top of the incredibly long list of things for which I am most grateful. The picture to accompany this post is not exactly a traditional Thanksgiving photo, but to me it expresses “family”. 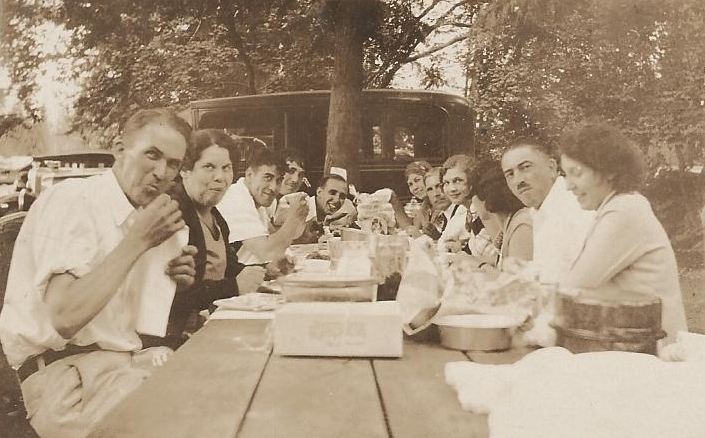 The people in the image are my father’s maternal side of our family, circa 1930-something. I never knew them – my grandmother died when I was very small (she’s the one at the farthest right) – but they look like people I would have gotten along with well. They seem to be having a great time and enjoying each others company. I will think about them today and will try to carry on the tradition on this Thanksgiving Day. If you know me, you know that I’m all about sharing what’s happening on our farm and I enjoy connecting people with little or no agriculture background to those directly involved in growing or raising our food, fuel and fiber. Illinois Farm Bureau helps run a program that makes this happen, it’s called “Illinois Farm Families“. 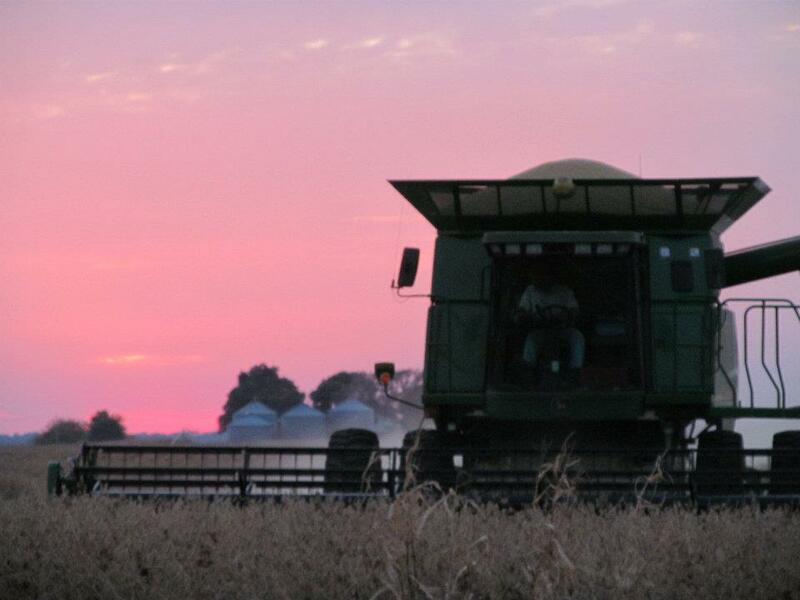 This program facilitates conversations between farmers and consumers, provides opportunities for non-farm folks to have their questions answered about food, farmers and farming, and also shares the reality of what actually happens on today’s Illinois family farms. I was fortunate to be asked to accompany the current group of the Illinois Farm Families’ “Field Moms” on an outing a couple of weeks ago. This was the final tour for this group of Chicago-area mothers that has been meeting periodically for the past year. 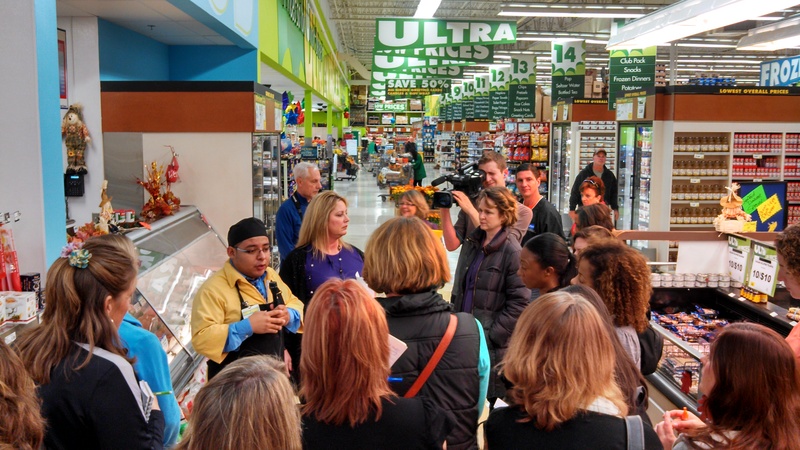 We met in the morning at a large grocery store in Wheaton for a back-of-the-house tour, and an enlightening discussion about retail food marketing with store management. We then spent the afternoon at the Northern Illinois Food Bank in St. Charles, volunteering our time to sort and package food for the hungry. 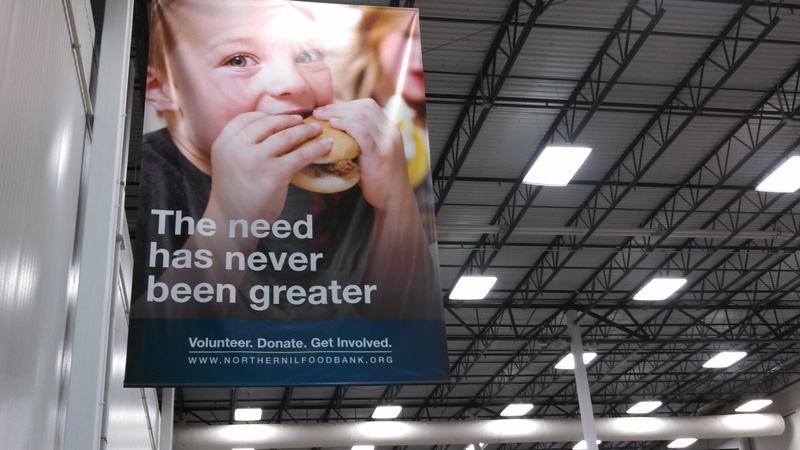 Last year, The Food Bank fed 500,000 people in 13 counties by distributing 50 million pounds of food. Our group was assigned to the meat department. My task was to inspect the donated packages to make sure that there were no rips, holes, or tears in the packaging, then send the meat on to other volunteers for labeling and sorting. Pallet after pallet of beef, pork, poultry, lamb and fish products were brought from the freezer warehouse, reassembled into 20 lb. boxes, to be distributed to food pantries, schools, and shelters. At the end of the day, our group was responsible for getting about 8,000 lbs. of meat ready to go. The Food Bank is a huge structure and on this particular Saturday was bustling with volunteers working to help those less fortunate. It was great to be a part of such a worthwhile group effort. I really enjoyed meeting the “Field Moms”, too, and having a chance to get to know a few of them as we worked side by side. 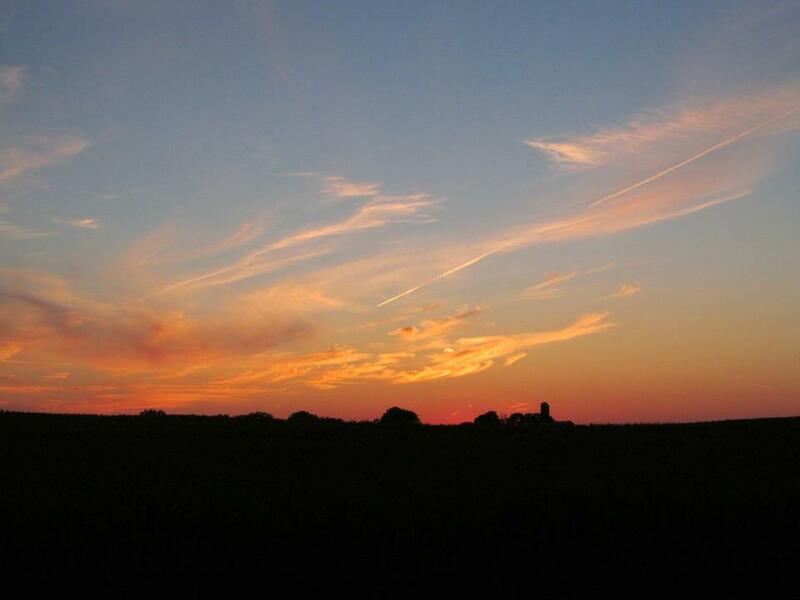 The Field Moms have visited a variety of Illinois family farms over the past year. The farm tours are planned for Saturdays in March, May, October and November; timed to show the cycle from planting to harvest. 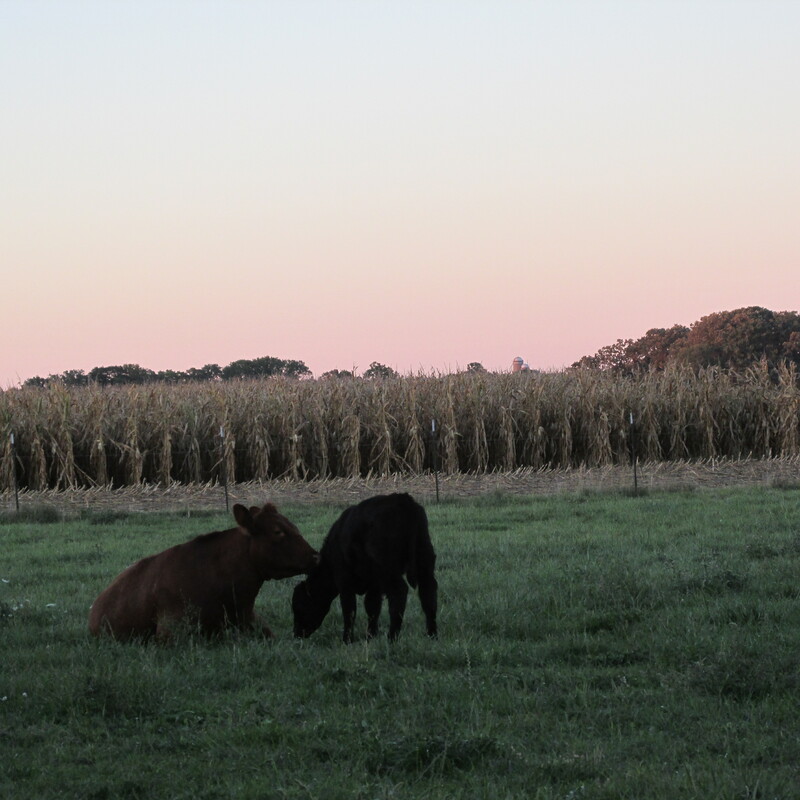 They have seen farms of all types and sizes, and have met farmers who raise crops like corn and soybeans, as well as those who make a living raising livestock such as dairy cows, beef cattle and hogs. The Field Moms share their firsthand accounts by submitting photos and a short blog about their experiences. As the 2013 Field Moms wrap up their year of interaction and learning, plans are being made for 2014. A new group will be selected soon. If the program sounds interesting, I’d encourage you to apply at http://www.WatchUsGrow.org – applications are due by December 15. Let me know if you have any questions. I recently read an article about the consequences of the waning “back-yard chicken” movement. To me, it’s rather sad, and I have to say that I saw it coming. A few years ago, urban and suburban folks, lured by romantic images of farm life, the “local foods” craze, and in pursuit of fresh eggs, decided that it would be a good idea to keep chickens in their residential back yards. A few municipalities in our area debated allowing chickens in non-agricultural areas. Those against the idea brought up practical reasons why poultry should be limited to farms, such as noise (often very early) from roosters crowing, the problem of waste disposal, associated human health risks, and the hazard the birds can cause when not confined by proper fencing. Those in favor prevailed in some cases, and ordinances were passed allowing poultry in non-agricultural areas. Designer coops were erected and exotic breeds of poultry purchased. The trend went along for a while, but now as reality sets in, unwanted chickens are being turned in to pet shelters, and specialty rescue organizations are being formed. Especially now, as cold weather approaches, many owners are seeking new homes for their birds. Winter means additional expenses and chores: heating coops, providing fresh, unfrozen water, extra feed, and more frequent shoveling and cleaning of the coops. 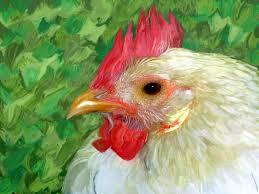 Many first time chicken owners are unprepared for, or grow tired of, the winter requirements. Another factor in winter is the lack of natural light. Hens very often will quit laying eggs as the days grow shorter. Artificial lighting can be manipulated to keep the hens laying eggs but that requires electric service and a timer. Hens will quit laying when they are 2 to 4 years old, but can live 10 to 12 years, which brings up another problem: what to do when the “pet” chicken is no longer productive. In commercial settings, these birds are used for meat, i.e. stewing hens. Many city people form pet-like attachments to their birds and can’t bear to part with them, or are simply unprepared for the long-term commitment. It’s one more reason why poultry shelters, like “Chicken Run Rescue” have come into existence. In the article that I read by Kim Palmer in the November 8 edition of The Beacon, Mary Britton Clouse, founder of the rescue, says that last year she had nearly 500 surrender requests. “All the other sanctuaries and shelters have noticed an increase. It’s like watching a train wreck in slow motion”, she says of the abandoned and neglected chickens that she sees. There are also health risks to both humans and poultry associated with keeping the birds in urban areas, that most new owners are completely unaware of. Most of them do little or no research, and report getting their information from the Internet. There are some capitalizing on the trend, like Al Bourgeois of suburban Minneapolis, aka “The Chicken Enthusiast” who, according to the article, has taught classes on urban chicken-keeping for the past four years. His curriculum includes a pragmatic “cautionary section” to “deter those with unrealistic expections”. Unfortunately, there are too many who ignore the warnings and proceed with their pursuit. My fear is that the number of unwanted birds will continue to grow until the fad completely flames out. The reported neglect and abandonments is not fair to the birds. There’s a reason why livestock are raised on farms. Let’s leave the farm animals on farms, and in the care of farmers. I took this picture earlier this fall. 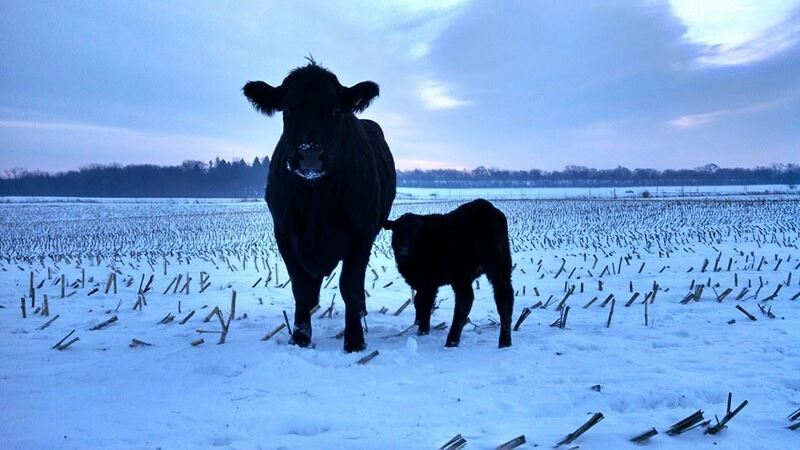 It’s one of my favorites because it shows the cow in her most essential role, as a mother. And as a mother myself, I can relate. Sure, the machinery and crop production is very important, but it’s the cattle that really come first. It’s our priority each and every day to provide the best possible care to our herd. Before we feed ourselves, we feed our cattle. 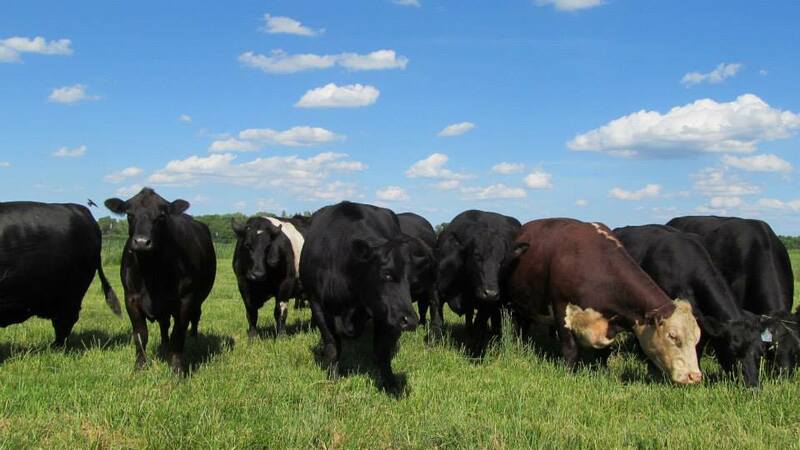 Before we move on to the other tasks on our lists, we make sure that the needs of our cattle are met. Before we go to sleep at night, no matter how long or tiring the day has been, we check to ensure that cattle have everything they need. It’s all about the cattle! This photo is one of my favorites, it’s from the Fall of 2001. My son, Grant, is now 22 years old and a senior at the University of Wisconsin-Platteville. 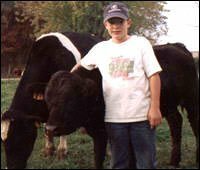 He still loves cattle and is planning to milk cows after he graduates in May with his Animal Science degree. And the heifer calf he’s with in the photo is still around. She’s now a cow named “Betty”. I’d like to think that the lessons Grant learned growing up around livestock helped shape him into the responsible young man he is today. He’s not perfect, but I couldn’t be more proud of him. 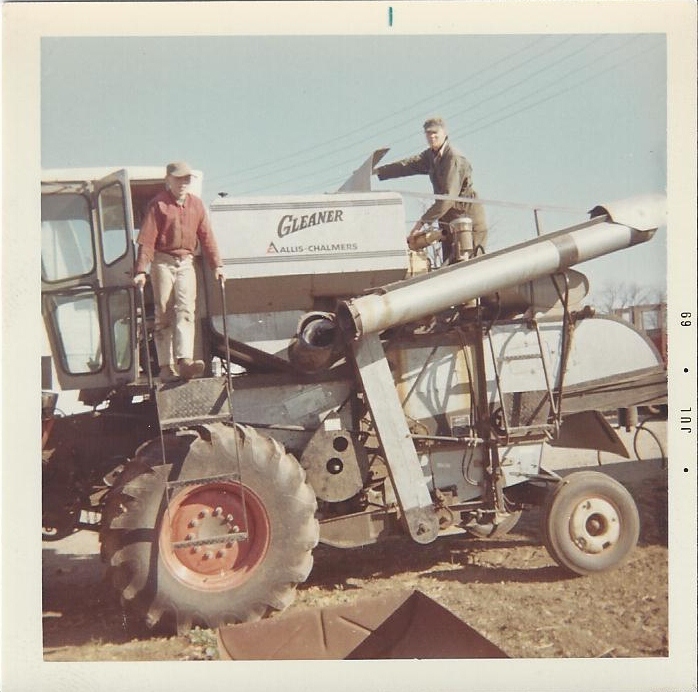 Here’s a harvest related photo from the late 60’s. It’s Gary and his dad working on their Gleaner combine. It’s remarkable how much Gary now looks like his dad did then. Back then, they were happy to harvest around twenty acres per day. Today, using newer equipment, we try to finish eighty acres in a day. The newer John Deere machine that we currently have has more than three times the horse power of the Gleaner. We’re very thankful for the improvements that technology has brought agriculture!